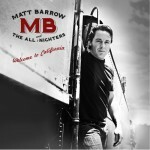 Matt Barrow And The All Nighters » MB & The ANS back at the 32!!! Home » Events » MB & The ANS back at the 32!!! MB & The ANS back at the 32!!! We are excited to be back at Ireland’s 32!! Truly the best kept secret for amazing live music in all of LA!! Always great music and never a cover charge!! Look forward to seeing all of you there!! !